Well, Randy Newman? Let’s hear you write an Oscar-winning song about a dirty sponge. related: The paper towels want a voice in where they live, okay? FINALLY! They’ve put it in writing! I told you those voices in my head were real!!! I’m going to change my scrolling screensaver from “Away from my desk–Be right back” to “Please replace me”. Those idiots will probably just promote me again. Or perhaps the mushroom was eaten before the first picture and that’s what prompted the whole scene. Yes, we definitely know who wears the square pants in this relationship. Or whose square pants are worn . . . The plot device is that the janitor is quitting and starting work at another building. And the kitchen stuff has to find its way there! Afraid to say that I also work with nutcases like this. It could be worse, you could work in an office like mine where everyone is TOO serious. To paraphrase my poker playing grandmother: If you look around the table and can’t spot the nutcase, it is probably you. Oh I know I am a nutcase… I just don’t like having to work with other nutcases. I would prefer they not steal my nutcase thunder. my mom does this too. she writes notes where the toothpaste wants to be and how much things want to be cleaned. Which is way more effective than just putting-away or cleaning those things, I’m sure! Hold on, Melissa; your Mom writes notes and attaches them to your teeth? That water bottle needs to go down to the Employee Assistance Program. He’s not four-fifths empty…he’s one-fifth full and needs to know that, own it and move forward with confidence. Well, 20% confidence in his worth at least. I think if the water bottle started getting frisky with the tea… things might improve? Bro just needs to get laid. This one is so awesome that it is now my desktop background! Somebody had way too much time on their hands! I’m confused as to why the Sharpie is badgering the water bottle about being adopted. Sharpie, what’s your point? I think the Sharpie was actually talking to the Splenda. 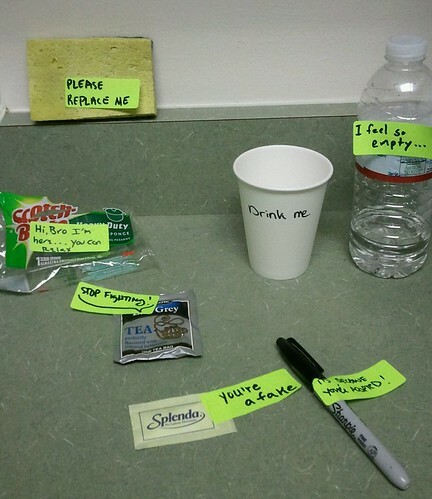 I’m confused who the sharpie is talking to….the splenda? Or is he commenting on the sponge conversation (the second one called the first brother)……guess it’s the crazy cousin that no one listens to anyway? Then the evangelistic feminist spoon will have to complain about the use of “guys” not being inclusive of her gender. Never could get “gals” to roll off my tongue right. I played with “dolls” for awhile, but that doesn’t work well…and those statements come out really wrong on up to three counts depending on your score on the Lipstein Perversion Scale! CB, you know what a doll is, don’t you? It’s an empty headed plaything. 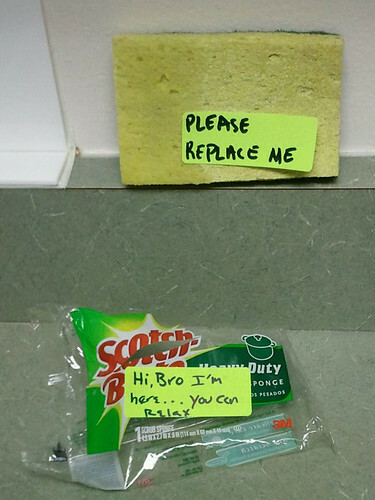 What about the post-it notes themselves? Don’t they have feelings? Can’t we just understand their perspective for once? My money says this is the kitchen of an ad agency, or the loony bin. Oh wait, those are kind of the same. And I just need to say, dixie, I am in awe of your use of the trademark symbol on your post. I can barely find the caps key. It kind of looks like all of them except for maybe the new Scotch Brite package were written by the same person. Which worries me. It’s not the sponge talking, it’s the bacteria. Haha! I love this one. At least people are having some fun at work! Now that’s what I call a good use of managed time in a work day. Where’s the stapler? It should have stopped at “stop fighting” that was hilarious but then it just kept going & wasn’t as funny. Just a smit like overanalyzing a joke, eh? Sharpie’s note got no wisdom, ya see? 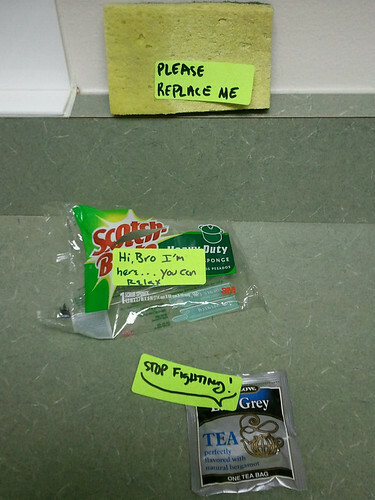 …don’t get that Sharpie note. Sharpie’s note got no wisdom, ya know? of course the jug’s empty! How much more can I even take? ?